Boating, just like any other type of transportation, comes with inherent risks. While the majority of boats are constructed safely, and the majority of operators are knowledgeable regarding how to safely operate a marine vessel, accidents may still occur. This is especially true if the boat is being operated by an intoxicated or inexperienced driver. If you are planning on being in a boat, it is a good idea to learn more about air boat accidents and how they may affect you and your life. In the state of Florida, you don’t need any type of special license to operate a boat. In fact, according to the law, any person who was born prior to 1988 doesn’t have to have certification in order to drive a boat. A person born after January 1, 1988 will have to acquire a Boating Safety Education I.D. card that is issued by the Florida Fish and Wildlife Commission. But, once this card has been obtained, it is valid for life. A common type of boat used in Florida is the air boat. Air boat tours are extremely popular. Even though most air boat operators have plenty of experience, there is no type of requirement for these boats to have safety devices, such as windshields, airbags or seat belts. In fact, these boats don’t have any brakes and they are usually operated at extreme rates of speed. Also, because of the design of the boat, they may stop short if driven over dry land. To illustrate the dangers presented by air boats, consider the accident that claimed a Florida woman’s life. According to the report, the crash occurred when a woman who had recently graduated from the University of Miami was taking an Everglades tour with her family on an air boat. The boat’s driver departed from the usual route for the tour for a moment because there was another boat that had broken down. When the boat returned to the path, it stopped suddenly, sending everyone on board flying off. The woman became pinned beneath the boat’s engine cage and as a result, she died from the injuries she sustained. There was no one else seriously injured in the air boat accident. The tour company is responsible for the safety of all passengers. 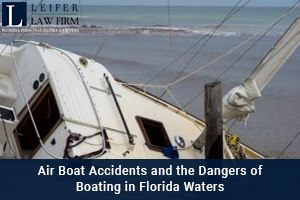 As a result, if a driver acts in a negligent manner while operating the boat, or if the company doesn’t keep the boat in good, working condition, then the company can be held liable for the injuries that occur. Anyone who is injured in a boating accident in Florida needs to contact a personal injury attorney to discuss the facts of their case. If you or someone in your family has been involved in an air boat accident, you may be able to recover monetary compensation. Regardless of the situation, if someone else was at fault, you need to speak with an attorney. You can learn more about these cases and get answers to your questions by contacting the personal injury lawyers from the Leifer Law Firm by calling 561-440-7697.